If you were to come to my house for dinner, chances are I would offer to make you an amazing falafel dinner. It’s one of my favorite meals to make! I would make homemade hummus with my own tahini, I would throw down a basket of gluten free naan, and we would slather it with tzatziki before loading it up with grilled veggies, and crispy falafel. 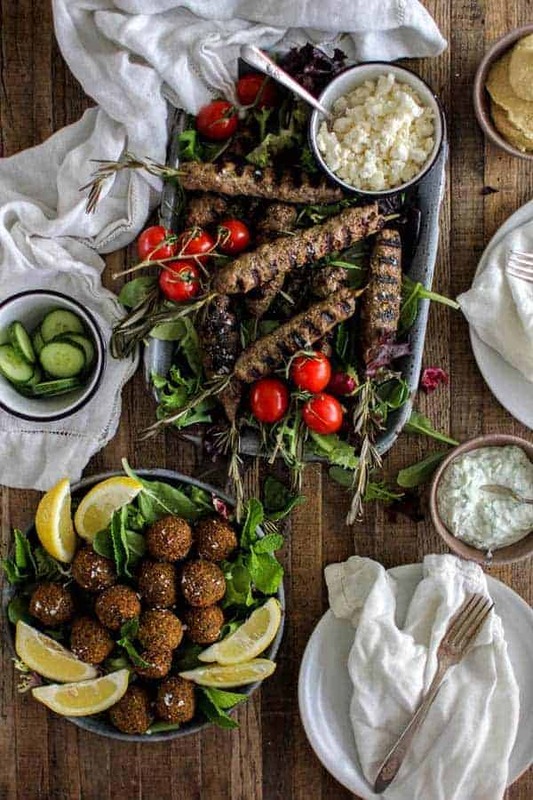 We would eat our weight in falafel and probably want to take a nap afterwards…seriously, it happens. Up until a few months ago I really thought I had falafel nailed down! That was of course until I read that real deal authentic falafel is made in a meat grinder. WHAT?! Honestly, I couldn’t wrap my head around it. With a primarily vegetarian household I tend to shy away from things like meat grinders, because seriously why would I ever buy one? Turns out after a lot of research that this $30 gadget is actually great for a lot of things other than making ground meat. Who knew? You can grind soaked chickpeas, herbs, and spices for falafel, you can also makes salsa, grind hominy for tamales, and even make fruit purees. Since Christmas was around the corner I asked for one. I am pretty sure that Todd thought I had LOST my mind, but being the super supportive husband that he is he went along with my whim. I made falafel the first opportunity I had and all I can say is WHOA! It’s a whole new ballgame around here and my falafel making game is officially on point. Now, I am not telling you that you have to have a meat grinder to make this falafel, but the texture is light and airy as opposed to being more dense and compact when you make falafel with a food processor. It is a world of difference in texture, both are amazing in flavor, and either way your family and friends will rave about your amazing falafel to everyone they know. However, if you are a true falfel snob like my family tends to be, a meat grinder is the way to go. It’s a super small investment for a lifetime of amazing falafel. Also – an added bonus that works no matter how you choose to make your falafel: This recipe makes a lot of falafel, but it freezes great! Form the falafel into balls or patties, freeze it on a sheet pan before transferring to a plastic zip bag for long term storage. The falafel can go straight into the hot oil from the freezer without a problem. Just add another minute or so to the cook time. Perfect golden falafel! Looking for a meaty main dish to turn your falafel fest into a full on feast? Check out our Rosemary Lamb Kofta recipe by clicking here. 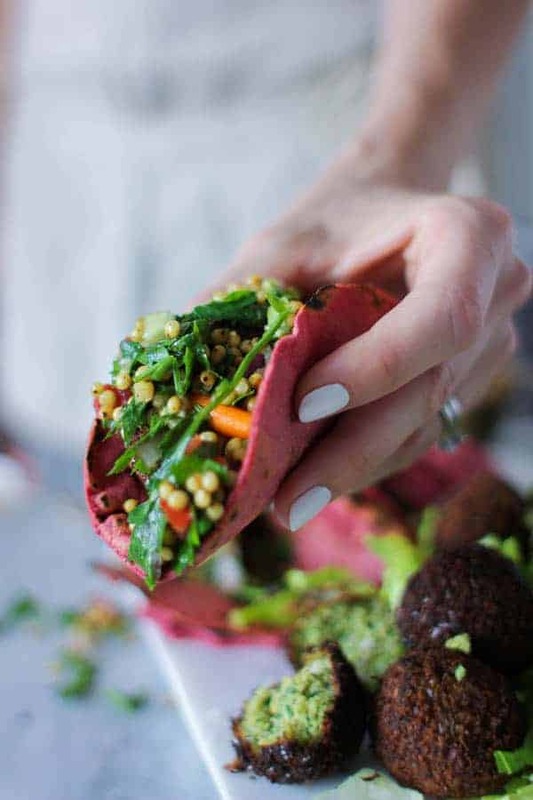 Or for a fun new spin on serving falafel try our falafel tacos with perfectly pink tortillas and sorghum tabbouleh!! Don’t get panicked by the 24 hour prep time – most of it is hands off soaking time for the chickpeas. You only have about 25 minutes total hands on prep time. Place chickpeas in a large bowl and fill with water to cover them to a depth of 3 inches. Cover the bowl with plastic wrap and leave on counter for 24 hours. The chickpeas will triple in size and absorb quite a bit of the water so check a few times during soaking to see if you need to add more water.Once the beans have soaked for 24 hours, drain and rinse well. Place the cumin and coriander seeds in an 8-inch cast-iron skillet and set over medium high heat. Cook, shaking the pan frequently, until the seeds give off an aroma and just begin to brown, 3 to 4 minutes. Transfer the toasted spices to a spice grinder and process until finely ground. Set aside. Place the drained chickpeas, ground spices, garlic, onion, cilantro, and parsley into a large mixing bowl. Stir to combine then feed through the meat grinder in small batches until everything has been ground. Mix the lemon zest, cayenne, salt, and black pepper into the ground chickpeas then roll a small amount of the mixture into a walnut sized ball or a small patty with your hands. The mixture should hold together nicely and not fall apart. Continue rolling the rest of the batter into uniform size balls or patties so that they will cook in the same amount of time. I used a small ice cream scoop and had falafels that were about the size of golf balls. Place the uncooked falafel on a large plate or baking sheet until ready to cook. Pour oil in a Dutch oven or a large, high-sided skillet to a depth of 2-3 inches, enough to cover the falafel. Place a thermometer into the oil and heat over med-high heat until the temperature reaches 360° – 375° F.
While the oil is heating place a flattened paper grocery bag onto a baking sheet and cover with a few clean paper towels. This will help to collect the oil as it drains off of your falafel. When the oil is to temp fry a test falafel. The oil should bubble up and sizzle all around it. The falafel itself should stay together in one piece and not break apart at all. It should take 2 – 3 minutes to fry to a beautiful golden brown. If your falafel is not completely submerged flip and cook the other side until it’s nice and browned all over. Remove the cooked falafel from the oil and drain on the prepared baking sheet. Sprinkle with coarse salt while the falafel is still hot. Fry the remaining falafel in batches, being careful to not over crowd the pan and drop the temp of the oil. 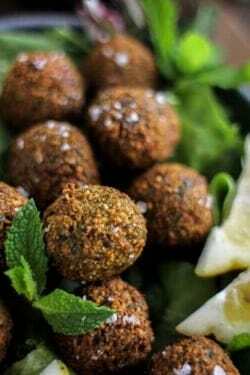 Do not use canned chickpeas when making this falafel recipe – using canned chickpeas will result in a completely different texture than the dried chickpeas and the falafel patty will fall apart in the oil. I want to come to your house for dinner! That sounds like quite the meal. I have a meat grinder (that has been used once) and I’ve never thought to make falafels in it – thanks for the awesome recipe inspiration! You are invited any time!! Put that meat grinder to work girl it makes the best falafel. Wow these look wonderful! I am honestly tempted to make these, but I’m thinking about how it will sound, “hubby, can we purchase a meat grinder?” Lol. Love it and great post! I’ve always wanted to make authentic falafel! Love this recipe! I think its settled. I need to head over to your house for dinner if this is what is served. I have a Ninja and use that to grind meat, I get better hamburger cuts to make hamburger with, but I love all forms of food. Just saying if you have the more powerful blenders, you don’t need a meat grinder. These look great! Will be trying it out very soon. and let it heat up and then poured the batter in the waffle iron and let it cook until done and crispy. I then spread the waffle with hummus and topped with my favorite greens, sliced cucumbers ,radishes ,red onions,boiled egg chopped,tomatoes (what ever you like on a salad) grated parmesan cheese or feta and your favorite dressing(MINE IS TZATZIKI) salt and pepper and enjoy!!! It is so good!! Usually I do only a half a waffle it is so filling. I make them and freeze them in the freezer and pull them out and toast them when ever I want . Try it I am sure you to will love it!!! I tried this recipe but with canned chickpeas, but they were falling apart. Does it make a big difference to use dried chickpeas ? Yes, unfortunately canned chickpeas won’t hold the same as dried chickpeas that have been soaked overnight. Thank you so much for sharing this recipe and your helpful hints! We made this recipe along with your gluten-free naan and tzatziki sauce. I purchased the hummus and tahini 🙂 My family loved every morsel of our dinner… and they are not vegetarian or gluten -free like I am. I have an old meat grinder that was my Grandmother’s. I had never used it. It must have been too old or the attachments were not suited for we couldn’t get the mixture through the wholes. Plan B – I used my Green Power Juicer with the grinder attachment. It worked wonderfully and gave us a great texture. Thank you again! We all give this recipe a 5 star rating and it will definitely become one of our favorite meals! Thank you! Wow! Simply wonderful! Made these tonight and my family devoured them. Will be making again for sure! Thank you so much for sharing. Wow, just tried making these for the first time and oh my goodness are they worth the effort!!! It did take me about 2 hours all together but I think that was due to the age of the meat grinder (which I was almost going to throw out the other day – so glad I didn’t!) This is going to have to be the way I always make falafel now. Thanks so much for your post! Agreed, it is a bit of a time investment, but so worth it! This makes so much falafel I like to freeze have the falafels and fry them later which makes for a much quicker dinner the second time around. I picked up a meat grinder attachment for my Kitchenaid stand mixer for about $50 and it makes the process so much faster. Tried a few times to make the perfect falafel but couldn’t. Finally stumbled upon this and it is the bomb. Thanks Meg. Better than buying the store falafel mix or the store bought veggie patties. Hi! I don’t own a meat grinder. Is there something else I can use *crossing fingers*? This sounds amazing and I’ve wanting to try making my own falafel! I did not notice that your recipe called for cumin seeds and coriander seeds, so I bought the ground, how much of each would I use? Hey Molly, no worries. I would probably still use about the same amount, 1 teaspoon for each. Don’t skip toasting the ground spices though it really brings out the flavor of the spice, just be careful they don’t burn. These falafels are amazing. We had some problems with them falling apart so we used a bit of egg and flour in the mix to hold them together. Other than that, it’s a fool proof recipe which has quickly become a family favourite! Could these be baked instead of frued? can i substitute fava beans for the chickpeas? Hi Dawn, I have never tried this recipe with fava beans, so I am unsure if it will work or not. If you give it a try let us know how it turns out! Woo! These turned out super salty! I thought 1 1/2 teaspoons sounded like a lot of salt and boy was I right! Next time I think I’ll just do 1 teaspoon. Otherwise, these were good. I put them in my air fryer for 15 mins on 370. Did you use kosher salt that is coarse or regular table salt? I imagine if you are using regular fine grain table salt it may be a bit much. So I made these from canned chickpeas and the falafel melted into the hot grapeseed oil as they were frying. Maybe it was because I did not use dry chickpeas? I did drain them well and all. Unfortunately this recipe will not work with canned chickpeas. They are just too soft, give it a try with dry chickpeas that have been soaked overnight. I promise the extra bit of planning is so worth it! Can’t wait to try this! Can these be baked instead of fried? Hi Lindsey, I have tried baking these in the past, but can never seem to get that perfect crispy exterior when I do, so I prefer to splurge and fry the falafel. 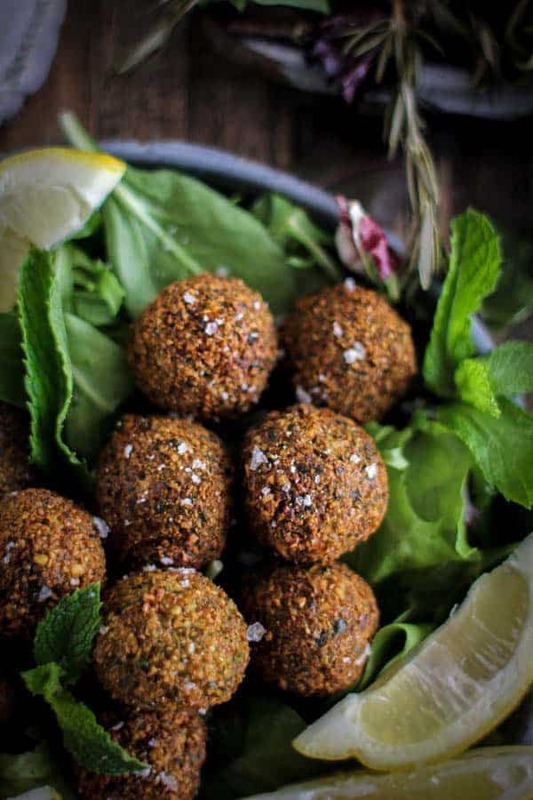 We Just want to thank you for this incredible recipe of falafel!! Now we are here in Spain enjoying such a delicius dinner!! We Made a photo with a beer to share with ourFriends. The fallafel is really beautiful!!! This recipe makes enough to feed 4 of us twice using a mini ice cream scoop. Any extra falafel you have though can be stored in the freezer. Just form the balls, place on a paper lined baking sheet and freeze before transferring to a plastic bag or freezer container. Then you can just remove a few at time to cook up whenever you like. First I want to say that I rarely post anything on the internet. That should give you a sense of how appreciative I am of this recipe. Second, this is the first time homemade falafel has ended in tears of joys rather than grief!! While I live in a city were finding good falafel is not hard to find but I have always wanted to make them at home and have never had any luck. I changed nothing about your recipe other than draining the chickpeas in advance and letting them dry a bit. I also refrigerated the mixture for a couple of hours because I ended up having to delay frying them. I did use a thermometer to monitor the oil temp as well. Can’t wait to try your other recipes. Thank you! Thank you! Thank you!. Marci, you just made my day!!! Good homemade falafel is always such a win. These also freeze great, so I like to make a batch – cook off half and freeze the other half for later. Remove them from the freezer while your oil is heating. They take a little longer to cook through, but there is hardly any effort the second time around. Amazing! I just made them for dinner tonight, we loved them! I just did this, with the meat grinder, OMFG THIS IS EXACTLY WHAT I WAS LOOKING FOR. Thank you so much for this idea. The falafel is crunchy, supertender and moist inside… best ever! Mazeltov! That’s so amazing!!! I’m glad you love this method for making falafel as much as we do!! Happy holidays! Thank you for this recipe. It’s really good!! Our family really enjoyed it. Awesome!! I am so glad you and your family enjoyed it! What meat grinder did you purchase? I have one that attaches to my Kitchenaid stand mixer. Made it with dried chick peas soaked overnight but still came apart in the oil. Any tips to keep the ball in shape? I squeezed water out as I rolled them. Was it too coarse? I used food processor but the link to the food processor method wasn’t working on this page so winged it. But it was tasty anyway. I’ve collected bits & pieces in the oil and made broken falafel wrap, and some became topping for my soup. Both were flavourful and lovely! That’s too bad!! Did you deep fry the falafel? If you only shallow fry them in the pan in a small amount of oil they will fall apart – they have to be completely submerged in oil. I really loved this recipe! I did initially start with the meat grinder, but it was getting blocked and not pushing through. Has anyone had this happen? It could totally be operator error as this was the first time I ever used it (despite it having being my pantry for for over 5 years!). So switched all ingredients to food processor. Was still fabulous & will be doing again whether or not I figure the meat grinder thing out!! Also, a note to people whom are making this for the first time. Definitely error on the side of burnt looking. thanks so much for the recipe!! Yay! I am so glad you loved it. I have had that problem with my meat grinder before and it was because I had the grinding plate on backwards. I’m not sure if that is what happened with yours or not, but it may be your problem. At the end of the day though, the food processor totally works – it just creates a slightly more dense finished product. Yay for more falafel feasts in your future! My falafel disintegrated in the oil. It would be helpful to put a disclaimer for those who consider using canned chickpeas. What a waste of good food. So sorry that you used canned chickpeas and it didn’t work out for you – I added a note to the recipe so hopefully that will help others in the future. Thank you! this is a Fabulous! thank you for sharing the recipe. I did pull out and dusted off the never used meat grinder for this recipe. However, I found it kept getting clogged by ingredients and ended up transferring to food processor to finish.Anyone else experience this? absolutely loved though and am planning to make again!! That could absolutely been the problem! I literally never used it before that day and had no instructions with it. So it took awhile for me to even figure out how to put it together and work it! I will give it another try though. thank-you! I made these two weeks ago. They were wonderful! So good I’m starting them again today for feeding vegetarian guests later this week. Only drawback is deep frying when its 103 degrees! I’m using our Lodge CI wok as the vessel. Doesn’t use such a large quantity of oil. Can do 5 – 6 falafels at a time w/ out a temperature drop. The avocado oil we use has good high working temperature and does not have a strong flavor. And it’s supposed to be healthy! No meat grinder so used the food processor, just needed to pay attention to texture closely. Can’t let’er Go on autopilot! Yay! I am so very glad you like them and I love the idea of frying in avocado oil! How many servings does this serving yield? You can feed 6-8 people EASY with this recipe! You can also cook just the amount of falafel you want then freeze any extra falafel once they are formed into balls. Then when you are ready to eat you just drop the frozen falafel into the hot oil. It takes a bit longer to cook time from frozen, about 1-2 minutes more per batch, but is super fast because there is literally no prep work involved. Want to make this but don’t have fresh cilantro can I use dry and how much should I use. Thank you. Can’t wait to make this. I have never tried to make these with dried cilantro. The vibrant flavor of the fresh herb really shines through. However, if I were to try it at some point I think I would try to start with 8 tablespoons (1/2 cup) of the dried herb. Typically you substitute 2 tablespoons dried cilantro for every 1/4 cup of fresh. Hope this helps! It was RIDICULOUSLY gratifying to watch my Kitchenaid grinder attachment tear through those chickpeas! Only had to push through the herbs and onion. Really delicious! Came back to the post to see if people had opinions as to fry up he rest before freezing or freeze raw. Thanks for a great recipe! I am SO glad you love the falafel & I totally agree that it is absolutely gratifying to watch the meat grinder go to work. I always prep my falafel all the way through forming them into balls the freeze them raw. Hi! Can you make this with frozen chickpeas? Hi Angela, I don’t think I have ever seen frozen chickpeas! So, here is the thing…if they are cooked then frozen no. If they are only soaked for 24 hrs then frozen yes. Cooking the chickpeas changes the texture too much. Oh Hope! I am so glad to hear you were able to make canned chickpeas work!! I am so glad that you like these falafel and can’t wait to try your version next time the craving strikes an dI don’t want to wait to soak.